Re-imagining one of my favorite scenes from 2002. I had always meant to re-render the original for widescreen monitors but I decided instead to re-do the scene in Vue. I wonder if Medussa herself walked by here... I like it, mysterious ancient solace of a place... The roof in its blues has a hint of a temporal place, its neither her nor there its not solid... I wonder if that was the intent? I appreciate how the color of the visitor's clothes changed in the multiscreen - the original seemed a bit washed out. It's lovely - I think I like both the night and day version equally. There's so much detail to look at it's hard to know where to start. I really love this. Over time, nature just grew up around it. It is more soft and interesting than the 2002 original, which seemed to me hard, stark and overpowered by the backdrop (even tho' I still appreciated it). Thinking about other real historical treasures that have recently been destroyed, this temple looks like it's waiting for the next caretaker to bring it back to life. "Surreal, and I wanna be there." A very archaic world scene that makes me want to journey back in time about 2000 years to see it for real. Thanks for making the dualscreen renderings available. Two of my computer setups are dualscreen arrangements, your single screen renderings do not fit them precisely. Dome of the Blue Seeress is awesome. I loved the original in 2002. I love this one even more! 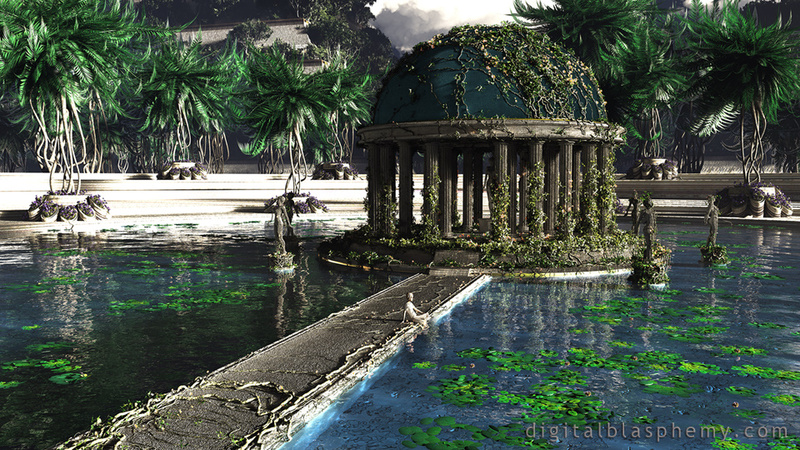 This re-imagining of the Dome of the Blue Seeress is more of an image of a much much older and distant temple. The first rendering is obviously the culmination of a great civilization at its prime. The background story must be told. Anyone? I can see your point of view. I honestly wanted it to look more "lived in" than neglected however. To see something so beautiful (your original) in a state of neglect and decay is not my idea of a good image. The original was a wallpaper for so long! It's great to see this version. I made it my wallpaper immediately!. Would love to see a lot of your old "temple" wallpapers get similar treatment! Thank you for keeping up the awesome work! "Wow! An amazing reimagining of a classic!" What else can I say? I've long been impressed with Ryan's artistic talent, but this update is truly amazing. Thanks for going the extra mile, Ryan! I've always enjoyed the original version, but as always, you managed to out-do yourself. I'm especially in love with the ivy on the dome. Excellent remake! I love this one! 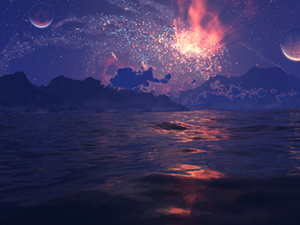 The abstract stuff is cool, but I love to see you do this type that could be an actual place. LOVE IT! I love this so much! What a terrific remake; thank you, Ryan! I do hope you plan on rendering a night version, or perhaps a twilight version. (Or both!) That's the only improvement that I can suggest. This is most beautiful. Love it!!! I want to see it, then I want to refurbish it, great job making it look abandoned and in need of attention. I have no criticism, great job! Could stand a little less. I still love it! This is a very evocative image -- but comparing the human figure in this one with the human figure in the 2002 version, it seems that the entire temple complex has shrunk (but then, I always thought that the original was implausibly huge)! The original Dome of the Blue Seeress is what got me hooked on your website, so it was great to see an update to it after many years. Keep up the great work! Fantastic. There are so many stories to tell. What a re-imagining. The atmosphere of decay and neglect did little to uplift my spirit. I remember loving your 2002 original - and can only refer to a reality that has indeed profoundly changed. It is both saturated and stark. The mood is tremendous. A scene that has stories to tell, and a place where imaginations can roam free. Love it. Love the image, but think that the human figure on the walkway distracts from it. This is a beautiful scene, Ryan! Absolutely love your landscapes and waterscapes! Can't wait to see the night version! Thank you so much! Simplemente hermoso, This is like going back in time, or discovering a fallen civilization on Earth, or advanced and very old civilization on another World, all wrapped in to One, Hands down, the best one ever, Awesome Render . This one brings to mind a lost city of a fallen civilization, somewhere deep in the jungle. Coming hot out the gate in 2017 with some all-timers!! Love it. Very nice re-render of the old DotS. I like the re-imagining of the setting, as well, from center of civilization to very jungle, lost-in-the-jungle type feel. I would also like to see a combination of the two leaning towards the older version in the middle of a city, too, vs houses. Really nice. You always surprise me, Ryan! "A very nice return trip"
A very nice trip back in time. "Also one of my old favorites"
I always love it when you get inspriation to revisit an older piece, and taking all your new talents and skills to turn out something that is both worthy of your name, as well as a fitting tribute. The other one that you've done in a similar light was the Gazebo one. This one is right up there with that one now.